Zambrano earned some clout. Soriano’s out. And Lee missed another game on paternity leave for the birth of his second child. Congratulations D-Lee, hope baby Lee and Mama Lee are doing well! Adding one baby to your 2009 stat line after writing this, just because, why not! Had fun at the Cubs game tonight at Citi Field…until about the eighth inning that is. Zambrano, who has struggled in the two games he had prior to this one since coming off the DL had a strong outing. His control seemed to be a bit off but he still got results. He gave up a solo shot to New York’s up and coming left fielder Cory Sullivan in the second inning but aside from that he was effective getting out of any self made jams and keeping the Mets off the board. From my seat in the second row of the front section of the upper deck behind home plate, I had a great view of pitches as they crossed home plate. The point of view up there (section 514 for the record) is amazing and makes it real easy to agree or disagree accurately with the ump’s balls and strikes calls. I think Zambrano got robbed a bunch, but then again, was the recipient of a few gifts as well. Parnell benefited the same for the Mets so all is fair in love and strike zones. Parnell has had a rough go of it for the Mets but he was strong through his seven innings as well. Not as strong as Zambrano though. The Cubs managed to load the bases three times in the game and unfortunately only came away with a run during the eighth inning. Timely hits was not this team’s strong suit tonight and I’m sure it didn’t help having Soriano on the bench and Lee’s bat home by the crib. Soriano is out indefinitely and I must say…I think we’re looking at 2010. I hate saying that before we are mathematically eliminated and I love our bench guys, I just don’t think we have enough to do what it takes this year. When I left Citi to the pumping fist of K-Rod and the smiling faces of Mets fans, the Rockies were up 2-0. Currently as I type this, the D-backs are up 4-2 in the bottom of the sixth. If the Rockies come back and win, putting us seven games out, I think that’s exactly what we’ll be, figuratively. Out. Seven is too much to over come without some ground-breaking miracle that MLB Network will talk about for ages. Without some kind of miraculous finish to the season, I think we’re done. I didn’t think that before I left today for the ballpark and I won’t think it until we are officially seven out. But if it comes to that, I believe we’re done. I got to the stadium in time for batting practice. I don’t normally get to the stadium that early and it was great. I was standing right by the outfield wall where all of the Cubs pitchers (most) were stretching and warming up their arms. Marmol looked great (too bad we didn’t see him tonight). Lilly was there and I took the opp to shout some praises. Berg was having a blast with kids asking him for baseballs, you could just tell he was digging it. And Grabow was being harassed by two 10 year old kids for a baseball. The same baseball he was currently warming up with. Funny what kids don’t get. Even after he said to them point blank, “I’ll give it to you when I’m done with it”, they still pestered him for it, asked why he needed it, and then began harassing another pitcher for the ball at his feet that he wasn’t using. This guy was warming up right next to Grabow, the guy who promised them his ball. Ah, the New York City public school system. One kid next to me during BP was pretty cool. Little Mets fan but clearly a baseball fan in general. He had asked me if I could help him point out where the Cubs were on the field during warm-ups that he had in his stack of baseball cards. Of course I could. He was very excited to see Ted Lilly in person and was hoping to get an autograph. I don’t know that that happened, but it was fun taking in BP with someone who still sees the game like an eleven year old kid. Baseball the way it should be. Once again Cubs Nation turned out and there were more Cubs fans around me than Mets fans in my immediately portion of the section. One Cubs fan who had never been to Citi before was surprised that there aren’t any bleachers. ‘That’s just not right’, he said. Funny how bleachers are such a part of Cubs baseball. He was floored that the stadium had no bleachers. As if it made the game of baseball impossible to be played without them…like the Mets’ new ball field had no place for shortstop. Funny. Good guy to watch the game with. Unfortunately after we celebrated the Cubs tying it up in eighth, I was correct when I told him the Mets would take the lead again once Gregg came out to pitch in the bottom of the same inning. I really dislike Gregg. He needs to be off this team in 2010. He has done nothing but hurt this team in the greater picture and he needs to go. Mets played great defense tonight aside from their couple of mishaps in the field. One easy pop up that should have been an out dropped in for Bradley and I believe it was Bradley again who benefited from an error at first. To make up for it all was Parnell who had bases loaded at one point and got out of it with two strike outs and then a brilliant defensive play on the mound when a shot up the middle fired at him and he was able to stop it and get the out at first. Unreal. Mets win 6-2…scoreboard watching time. Let’s hope we don’t let the GB mark reach seven. Tomorrow’s another day at Citi and I believe Lee will be back. No Soriano, but we’ll see if Fuld can make something happen. And while Zambrano did his thing today, he deserved a win he didn’t get. That’s to the fault of the Cubs inability to score guy in position and keep the stranded total down. Hopefully that changes tomorrow and Marmol gets to show his stuff successfully in more than just the warm ups. Get the W tomorrow boys….Go Cubs Go! Heading out to Citi Field in a little bit. Seats in the upper deck behind home plate, good seats to scoreboard watch from and root for the D’backs to beat the Rockies and the Cubs to beat the Mets. Hoping to catch Cubs batting practice. Not expecting a lot of home runs tonight with Citi’s horrible dimensions when it comes to the long ball. If it’s true that chicks dig the long ball, I doubt chicks dig Citi Field. Let’s hope they keep Zambrano under control if he takes BP. Don’t need him pulling anything or adding to his back problems trying to yank one out of Citi when it doesn’t even count. 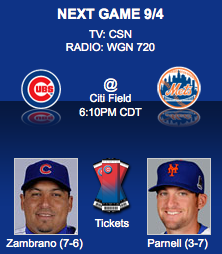 Zambrano needs to have his first quality start since coming off the DL. Last time he faced the Mets he was extremely ineffective. Hopefully he’s worked out the mechanics issue he’s had of late and is back to his old self tonight. Mets will have Parnell on the mound. With a record of 1-4 after five starts and an ERA of 10.29, this is another guy looking to get on track so I guess it’s a race to see which pitcher can put it together the fastest. With the park dimensions, it’s going to take a lot of small ball to beat the Mets at their own game tonight. 81 degrees and partly cloudy at game time is the forecast. Should be a beautiful night for baseball. Expecting to see a lot of others at the game wearing Cub blue. You know how we do in turning out at road games. LET’S GO CUB-BIES! I’m sure to be matched by many LET’S GO METS cheers. Can’t wait. Go Cubs Go! Back later tonight with a recap!